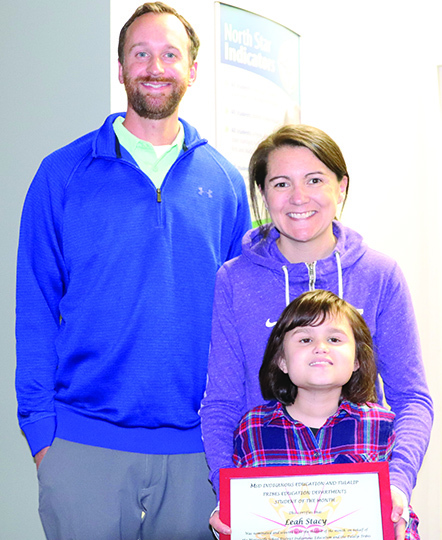 Previously, only one girl and one boy student were honored, but the program has grown to include one impressive student from each of the elementary, middle, and high school levels. 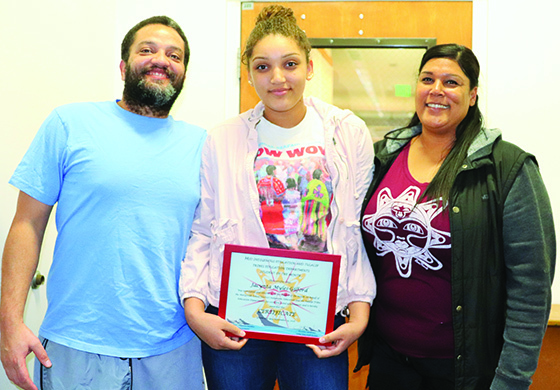 For their commitment to excellence in the classroom and backed by strong recommendations from school faculty, Dakota Laducer of Quil Ceda Tulalip Elementary, Devaney Jones of Totem Middle School, and Keyondra Horne of Marysville Getchell High School were announced as students of the month for November. 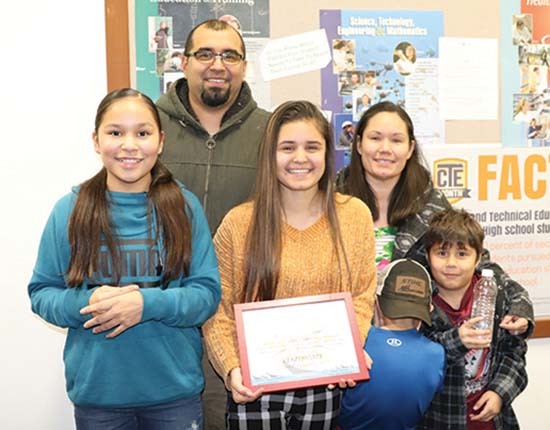 The three students, all Tulalip tribal members, received special recognition and were given a commemorative certificate during the Marysville School District’s school board meeting held on Monday, December 10. Dakota Laducer, Quil Ceda Tulalip Elementary. QCT Elementary teachers and Admin staff turned out to cheer on Dakota. 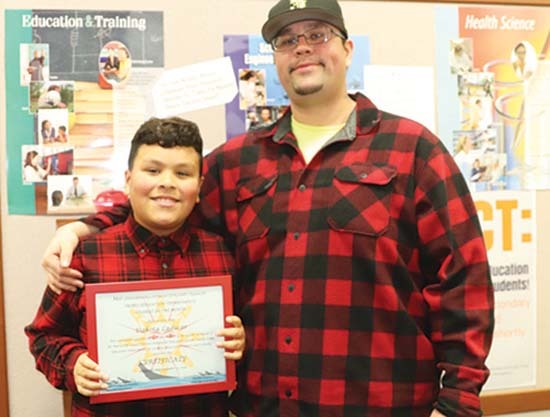 Dakota accepted his award with a large ovation from the crowd as many Quil Ceda Tulalip teachers and administrative staff turned out to support the young man’s academic milestone. Devaney Jones, Totem Middle School. Keyondra Horne, Marysville Getchell High School. Going forward, a selection committee will review all student nominations based on their academics and school engagement. Each month three students (representing elementary, middle and high school levels) will be recognized as students of the month. For more information or to nominate a student, please contact Director of Equity, Diversity & Indigenous Education, Deborah Parker at 360-965-0059. 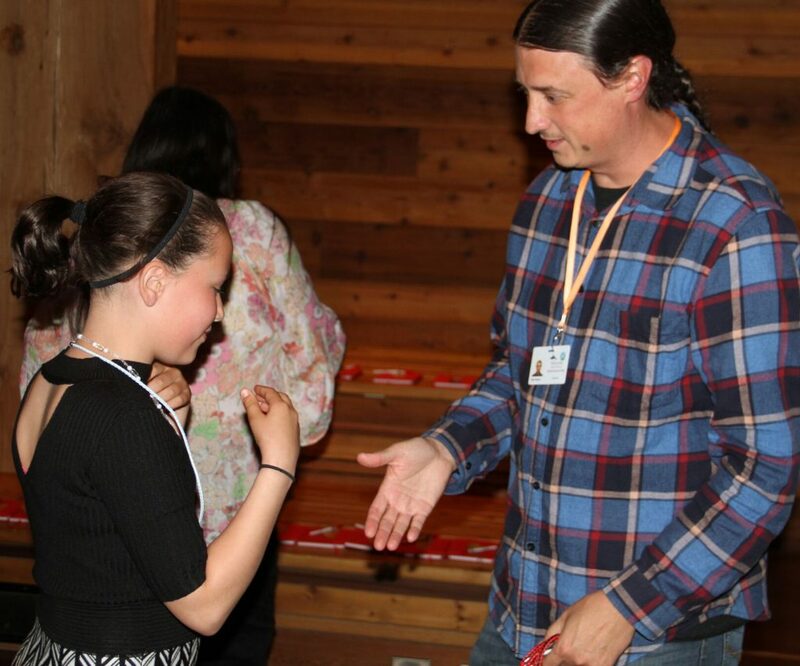 The Marysville School District (MSD) Indian Education Department held a ceremony at the Hibulb Cultural Center Longhouse on the evening of May 31, to honor their fifth-grade students who will be making the transition from elementary to junior high next fall. 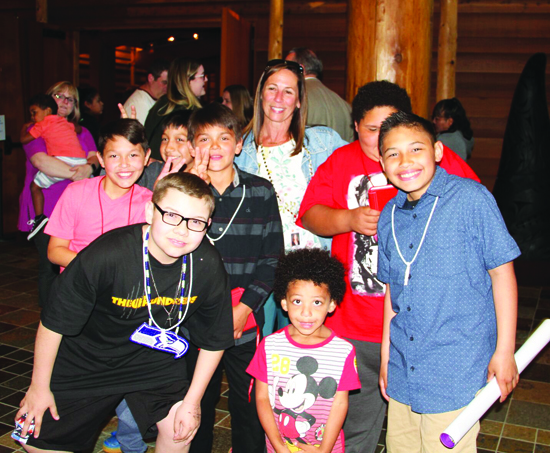 Native students from the Allen Creek, Cascade Grove, Liberty, Marshall, Kellogg Marsh, Marysville Co-Op, Shoultes and Sunnyside elementary schools were recognized for successfully completing grade school and beginning the next phase of their educational journey. 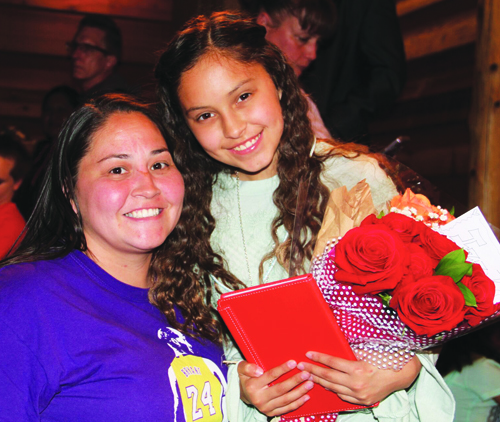 The traditional graduation ceremony was inspired by the Quil Ceda Tulalip fifth grade potlatch that is held at the end of every school year. 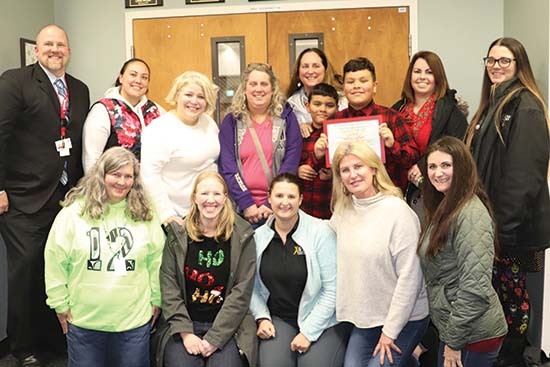 MSD native liaisons were motivated to create a similar ceremony to honor the native students who attended other elementary schools throughout the district. 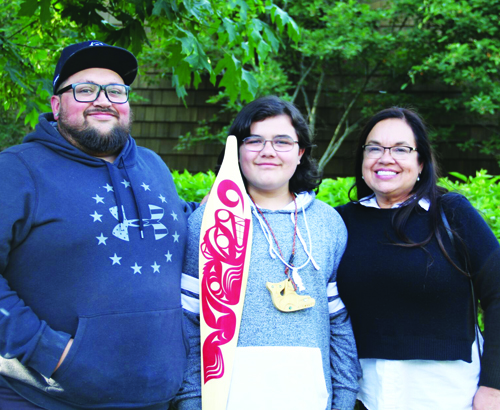 During the ceremony, the students are gifted necklaces with cedar-carved salmon pendants and are offered words of support and encouragement from Tulalip tribal leaders. The ceremony also serves as a means of introduction between students who will be attending the same middle school but attended different elementary schools; as well as between students and the native liaisons of their new school. MSD native liaisons Terrance Sabbas and Matt Remle performed an honor song for the students on the traditional round drum and presented them with cedar necklaces. Each liaison also introduced themselves and shared their excitement with the future middle schoolers. The MSD Indian Education Department also thanked Cascade Elementary Principal, Teresa Iyall Williams, for her years of dedication to the youth as she’ll be enjoying the retired life after this school year. 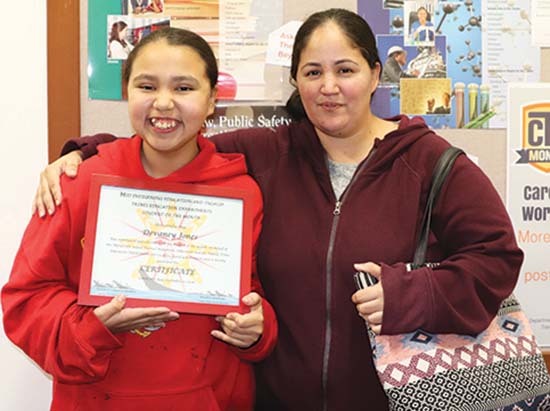 Teresa was blanketed by the Indian Education Department and referred to as an ‘inspiration to all the young native girls’ and ‘a great example of how to conduct yourself’ by Tribal member, Denise Hatch-Anderson. The students received journals from the MSD Indian Education Department so they can document the next three years of their middle school experience. “The excitement you have, I hope it continues all the way until you graduate from high school and from college. 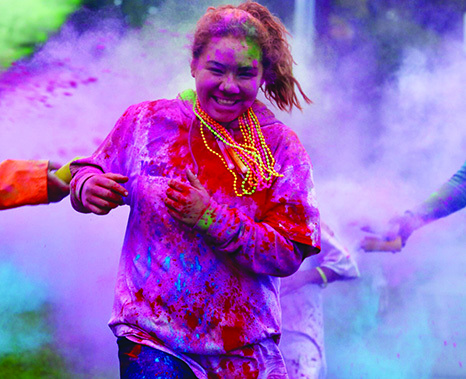 Whatever you choose to do in this world, we ask you to dream big,” said Deborah Parker, MSD Director of Equity, Diversity and Indian Education. 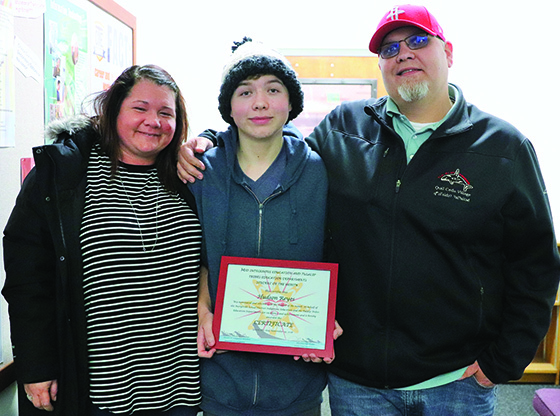 Dreaming big is exactly what the students plan to do, including Tulalip tribal member Conner Juvinel, who plans to continue pursuing his passion during his middle school years. 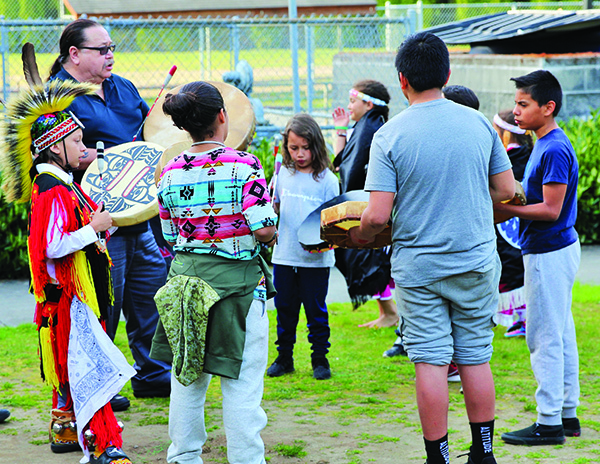 All families and students of the Tulalip-Marysville community were invited to an evening of cultural exploration at Totem Middle School on May 18th. 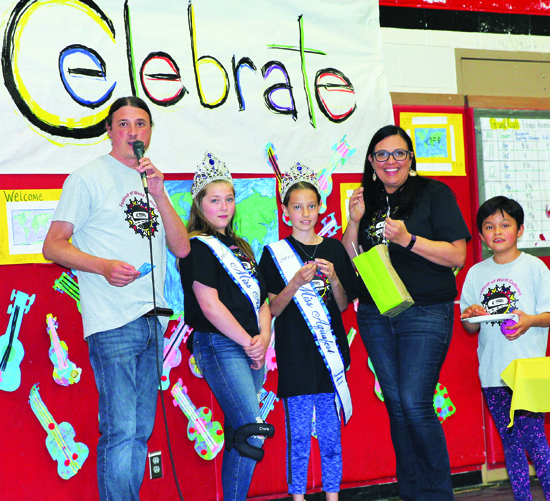 Offering a free, fun-filled event with a variety of music, dance, art and food for all, Marysville School District (MSD) presented the Festival of World Cultures. 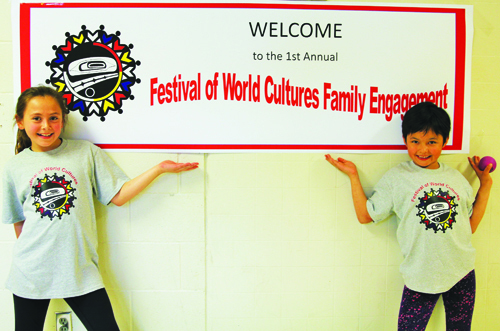 Community involvement played a large role in the development of the Festival, as coordinators reached out to local businesses, cultural performance groups, and a variety of vendors who could engage with people of all ages, from children to elders. 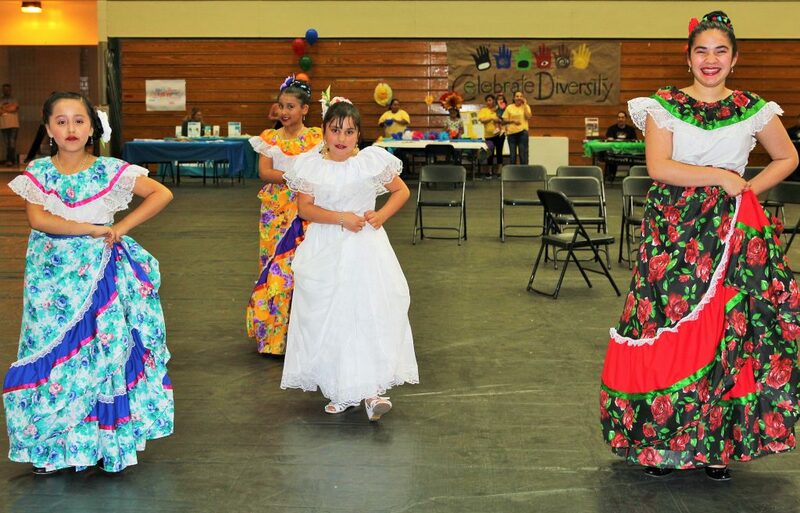 The planning paid off big time as more than 300 people showed up to celebrate diversity and learn about other cultures. Attendees were each given a mock passport that were then stamped with approval throughout the evening as they travelled the world and learned from representatives of twenty different nations. 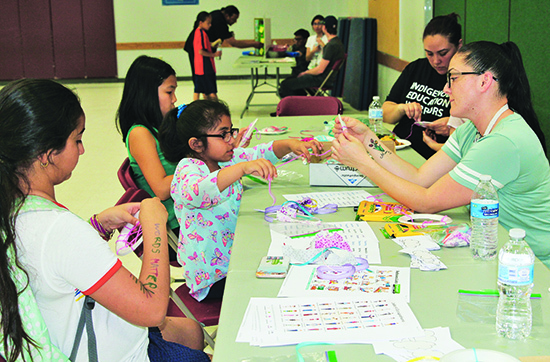 There was something offered for everyone in the family-based atmosphere providing entertainment and many laughs, while engaging everyone’s curiosity as they made their way through a variety of informative booths. Several culture representatives distributed knowledge through collaborative activities that had people learning while having fun. 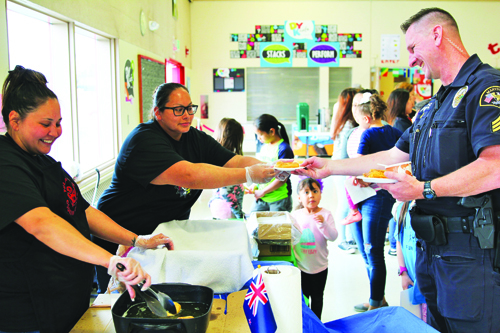 Some families made quite the journey to learn about cultures different from their own, even families with students from outside the Marysville School District. 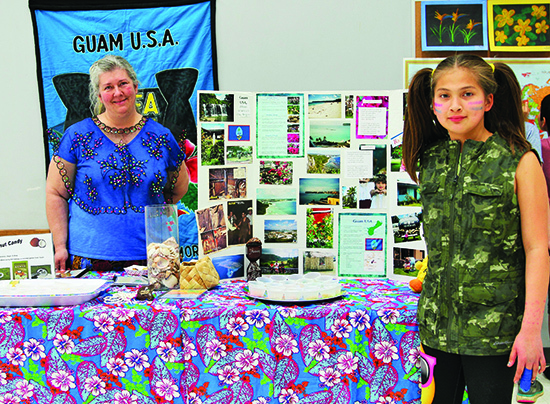 Gloria Campbell and her granddaughter Araba, both of West African ancestry, saw a flyer for the Festival of World Cultures online and travelled from Mukilteo to partake in the event. 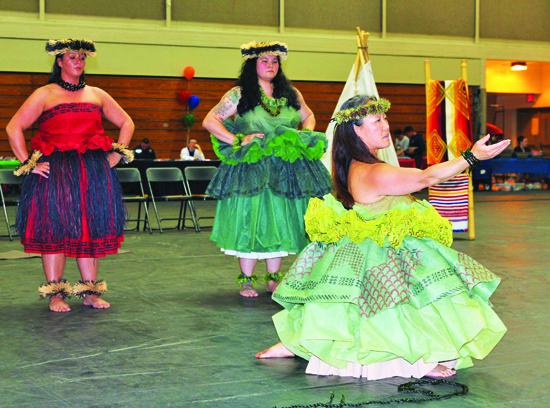 After feasting on a diverse selection of food, including the ever-popular fry bread station, Festival guests were treated to song and dance offered by Native, Hispanic, Pilipino, and Hawaiian cultures. Officer Sparr of Marysville Police Department enjoyed the Festival and having the opportunity to interact with so many children in such a positive setting. 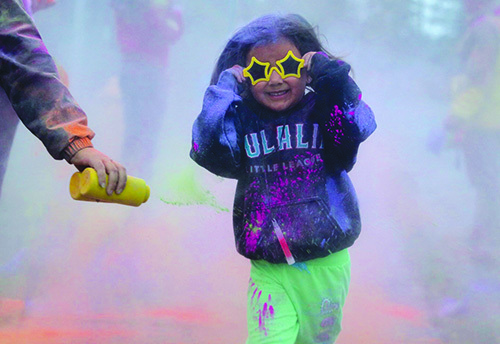 “This is how community events should be”, Officer Sparr said. 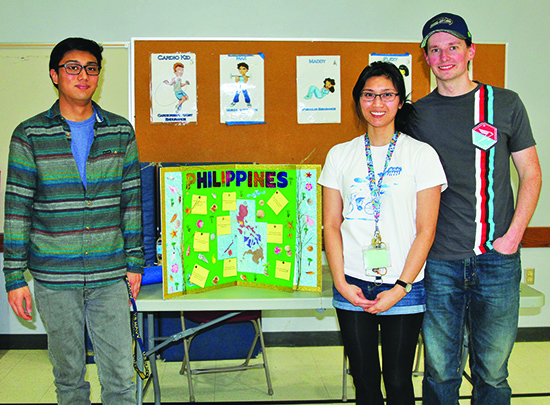 The Festival’s success garnered enough excitement that one for next school year is already being planned. In October of 2014, our community experienced first-hand the horror of a senseless school shooting. Unfortunately, we were not the last community to experience such tragedy. In light of the recent events, students across the country, including Marysville, are organizing to express their unique perspectives on this continuing national issue. 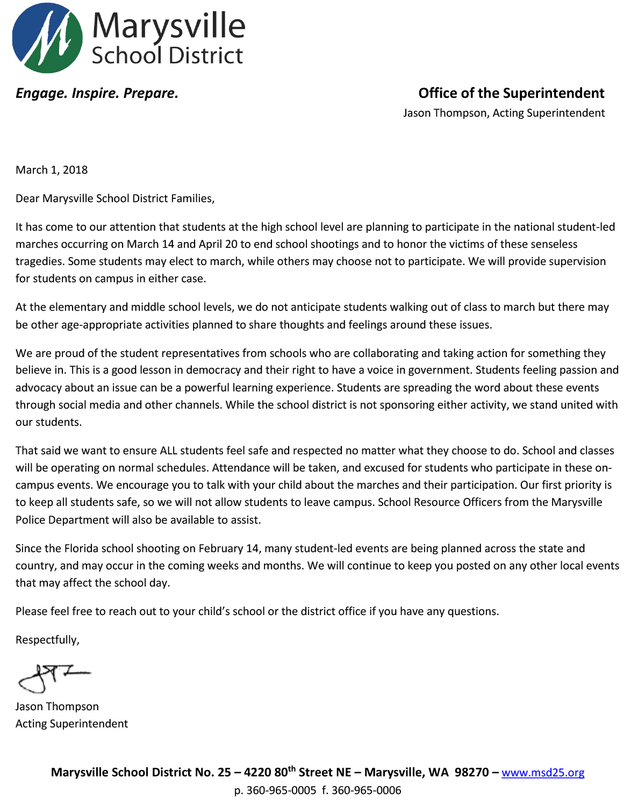 We, the Marysville School District, support our students in exercising their First Amendment rights, including participation in the student-led marches. Our responsibility as educators is to keep students safe on campus, and to encourage respectful dialog and expression of ideas and beliefs. We stand beside our students in their advocacy and share our sadness for the loss of life in these senseless acts of violence. The Marysville School District (MSD) is comprised of twenty-two schools including ten elementary, four middle and eight high schools. 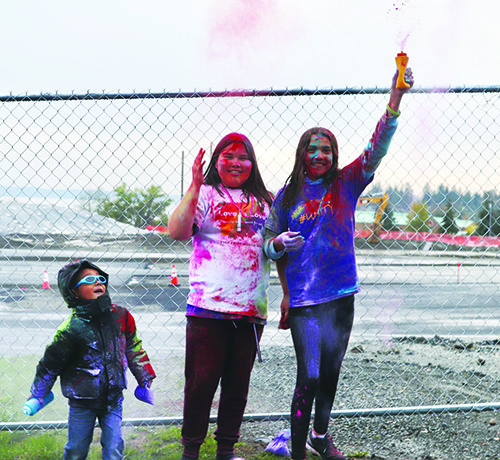 The majority of Tulalip students attend schools within MSD as the entire reservation is under the school district. 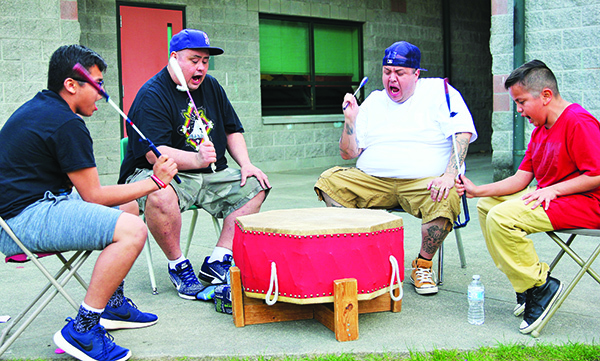 Tulalip is home to Quil Ceda Tulalip Elementary School, 10th Street Middle School, Tulalip Heritage High and Marysville Arts and Technology High School. 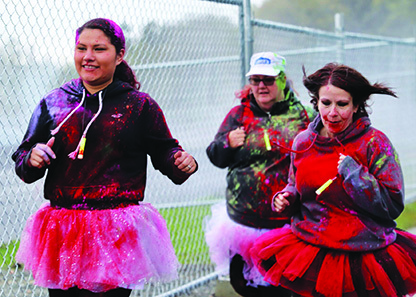 MSD is split into five separate districts based on location, the Tulalip reservation is within and accounts for a large portion of District One. A representative from each district is elected by the community to serve on the school board every four years. For the past eight years, Chris Nations has been the MSD District One Board of Director and is up for re-election this year. 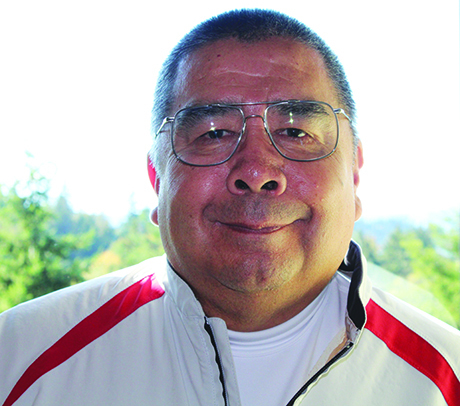 Tulalip tribal member, Ray Sheldon Jr. is challenging Chris for the District One seat and is progressively gaining more support as the election day of November 7 draws near. Ray has been actively involved within his community, coaching little league baseball for nearly thirty-five years. 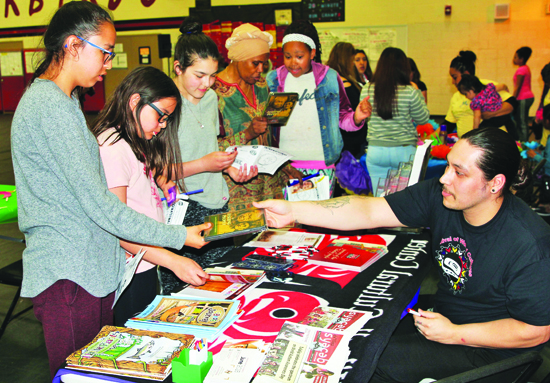 He also is a strong supporter for special needs children, volunteering his time to numerous non-profits including Leah’s Dream Foundation, an organization, founded by Tulalip member Deanna Sheldon, which assists local students with autism by raising funds, planning events and providing support to both parents and students. “I’m an advocate for special needs and the kids that need care because I have four grandkids who are categorized as special needs,” Ray explains. “I don’t think the school district spends enough money for these people and kind of shoves them in the corner, which bothers me big time. I think we need to help those special needs children. Special needs doesn’t necessarily mean they’re stuck in a wheel chair, special needs are also the kids who have trouble reading or with dialect or anything else. The school doesn’t pay enough attention to them and we should start teaching and spending time with them. Former MSD board member, Don ‘Penoke’ Hatch, not only endorses Ray, but has been the main source of inspiration, providing the candidate with advice and encouragement throughout the race. In previous years, while Penoke served for MSD, community members voted only for their district representative; now community members can vote for all five district representatives. Ray believes that this procedure is flawed because it allows candidates to campaign outside of their district, therefore leaving many of the districts’ needs unattended when the candidate takes office. During the 2016-2017 school year, MSD had just over 11,000 students attending their schools. Of those 11,000 students, six hundred and ninety-six were Native American and 1,749 students were special needs children. Over the course of recent years, MSD has slowly seen a decrease in attendance. Tulalip and Marysville community members who are not registered to vote in Snohomish County must do so online or in person at any Washington Department of Licensing office by October 9, in order to be eligible to vote for Ray during the upcoming election. Ballots will be mailed out to registered Snohomish County voters by October 25, and must be filled out and mailed by 8:00 p.m. on November 7. For additional information please visit the ‘Ray Sheldon Jr. Candidate for MSD #25 District 1 Director’ Facebook page. 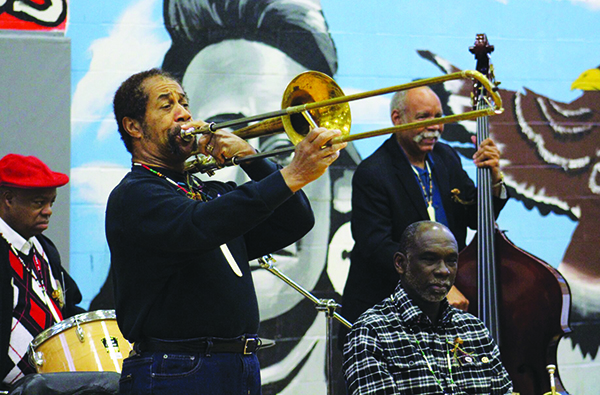 As the last note of their second set was hit and spit valves were emptied, trumpet extraordinaire, Gregg Stafford, approached the microphone at the Francis J. Sheldon Gymnasium. 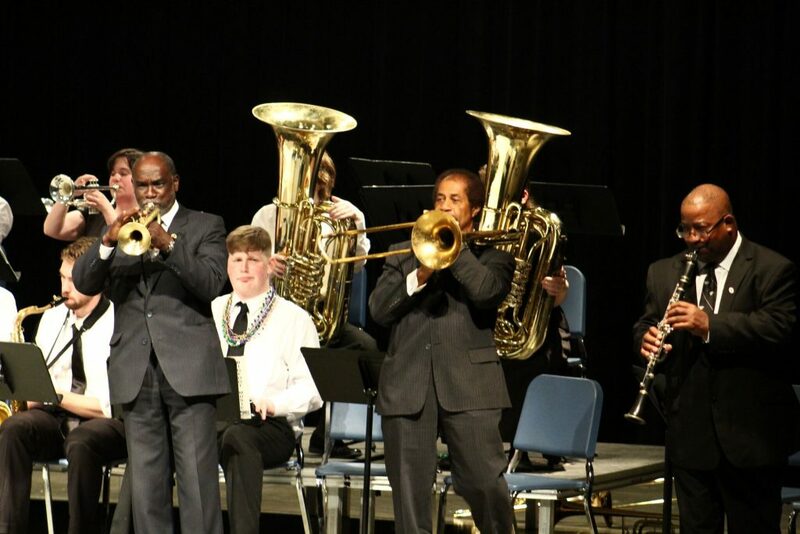 He graciously thanked the audience of middle and high school students for the standing ovation he and his fellow band members of the Preservation Hall Legacy Jazz Band were receiving. 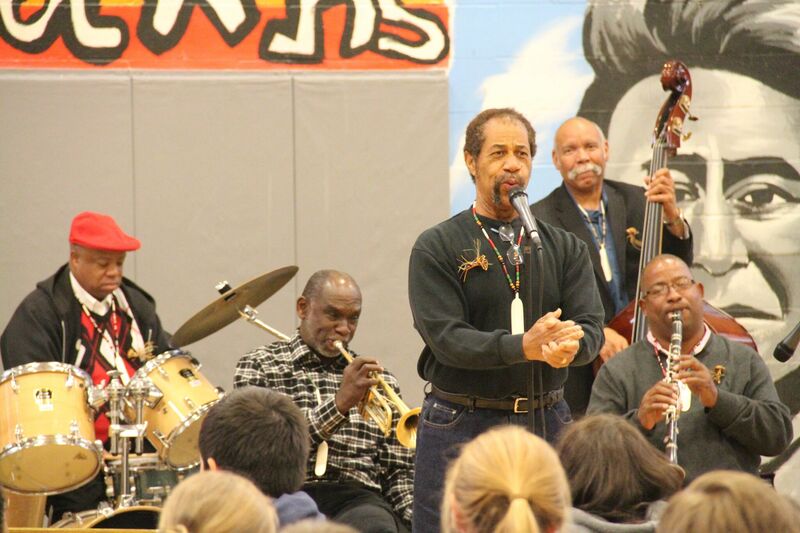 The traditional six-piece New Orleans jazz band recently traveled to Tulalip to perform and speak with the youth of the community about jazz history, culture and the importance of keeping traditions alive. 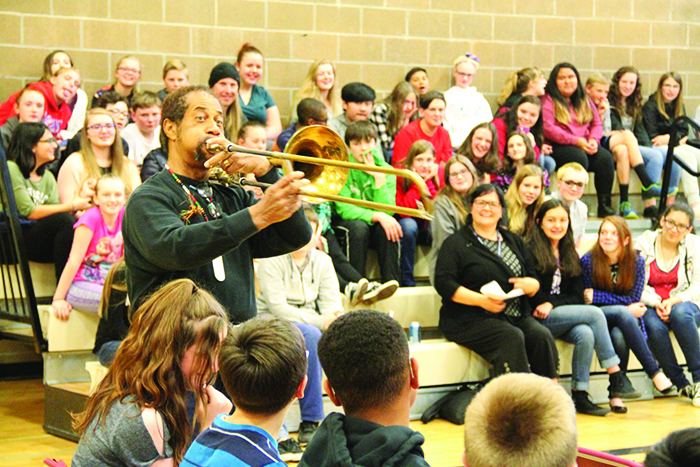 During their week-long visit the band performed for over 4,000 students at schools within the Marysville School District including Quil Ceda Tulalip Elementary, and Heritage, Getchell and Marysville-Pilchuck high schools. 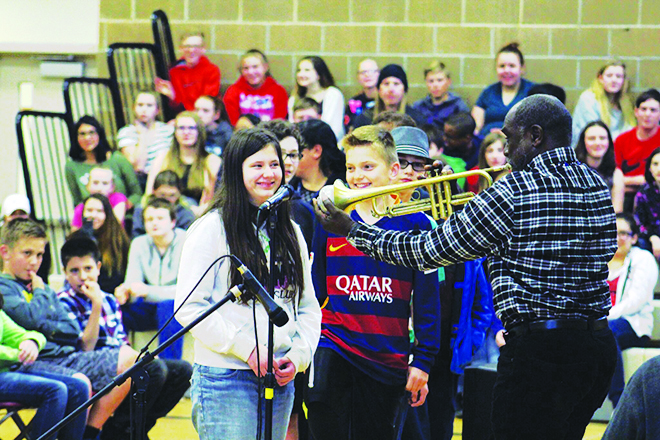 After the much deserved cheers and applauds began to quiet down, Gregg informed the students that the band would be answering any questions the students had for them. The kids asked a variety of questions ranging from who is your favorite jazz singer to more complex questions regarding mutes, tempo and time signatures. Inevitably, a student asked ‘how long have you guys been playing?’ In this moment Gregg, along with trombonist Fred Lonzo, clarinetist Louis Ford, pianist Lars Edgrean, bassist Richard Moten and drummer Joesph Lastie Jr collectively grinned as Greg looked at his watch and responded ‘oh about twenty-five minutes now.’ Laughter filled the entire room, most notably from the band. 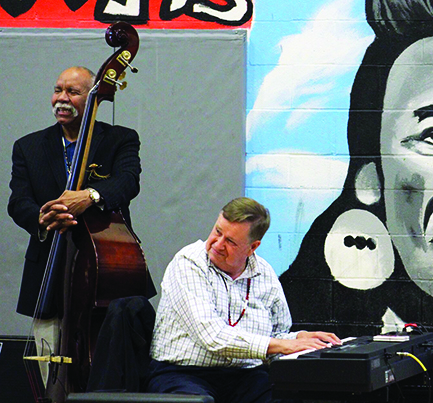 Those small joyful moments, within the twenty-five-minute jazz set, where the entire room is smiling ear to ear, sharing laughter with one another and getting lost in the music is the reason Tulalip Tribes Employee Assistance Counselor, Jessica Talevich, brought the Preservation Hall Jazz Band to the Pacific Northwest. 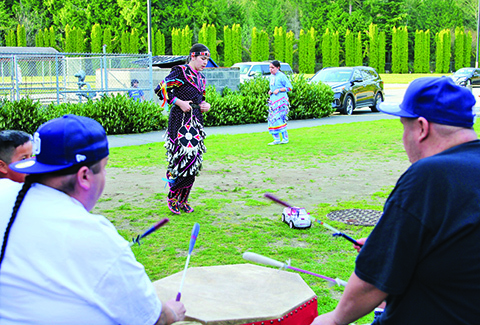 Tulalip Tribes Employee Assistance Counselor, Jessica Talevich (right) dancing to the band during their performance at the Hibulb Cultural Center. Nearly two years ago, after witnessing the band live in their native New Orleans and once again in Seattle a week after, she discovered the band offers outreach work to high schools nationwide. 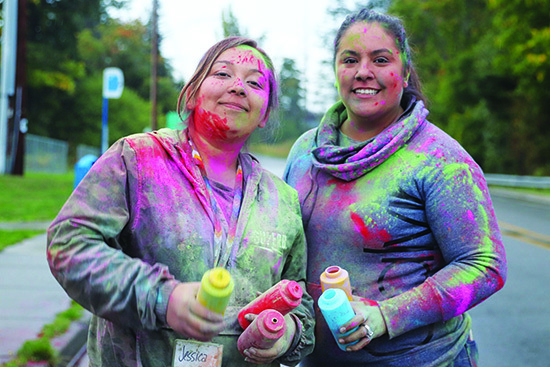 In the wake of tragedy amongst the Tulalip-Marysville community, Jessica consistently witnessed division as several messages from ‘talk-based’ outreach programs missed their mark and constantly reminded community members of their hard times. 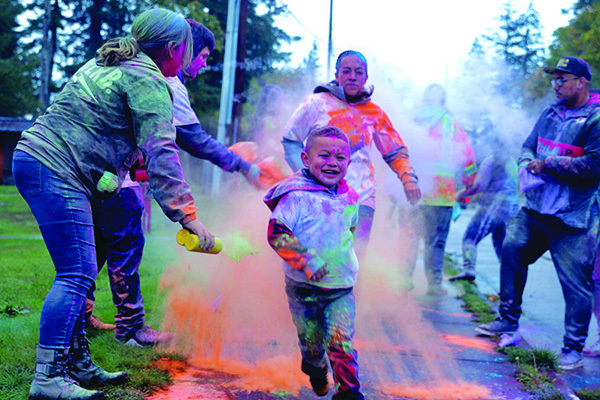 In an effort to change the cycle and promote healing, Jessica and the Tulalip Tribes partnered with the Marysville School District to bring the unique outreach program to the community. 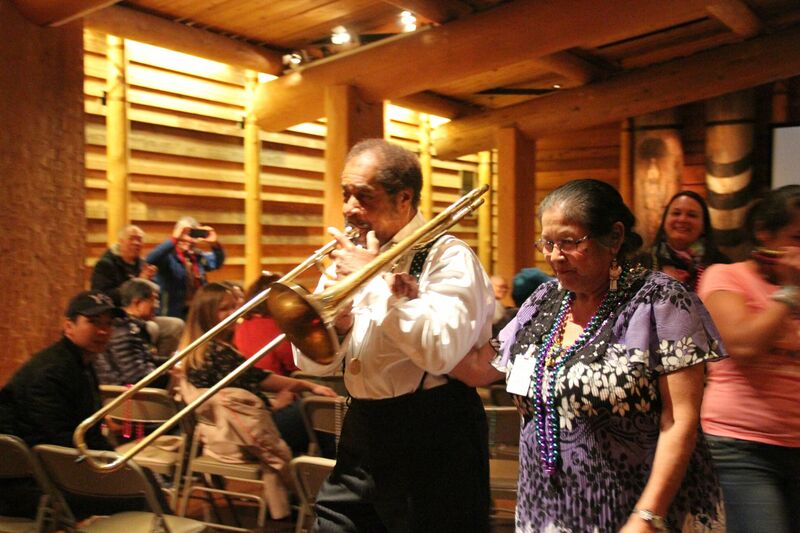 After a tour of Tulalip, hosted by Tulalip tribal member Freida Williams, the band performed for the community at the Hibulb Cultural Center. 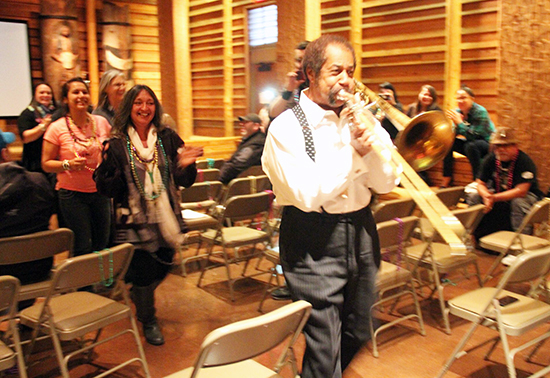 Plenty of audience members danced and joined in a march led by Fred while he performed a solo on his trombone. Following the performance, the band had an open discussion with the audience touching on subjects such as the ever-changing music industry and music education. Gregg inquired about the local population of black bears and the tribe’s hunting regulations. 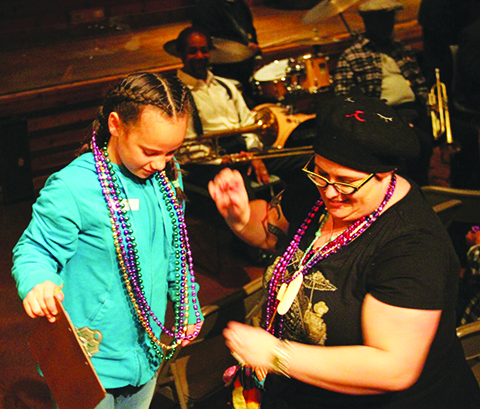 Tulalip tribal member Natosha Gobin and her children were present for nearly every Preservation Hall Jazz Band performance to offer prayers and gifts to the musicians. 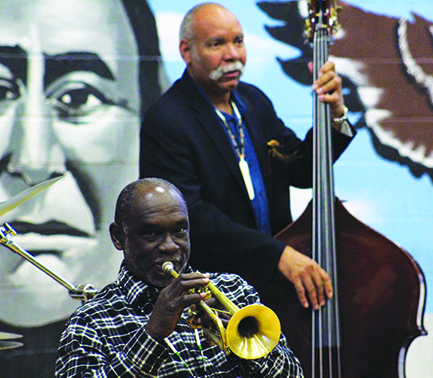 On their last night in the community, the Preservation Hall Jazz Band spent the evening performing for a large crowd in the Marysville-Pilchuck auditorium. 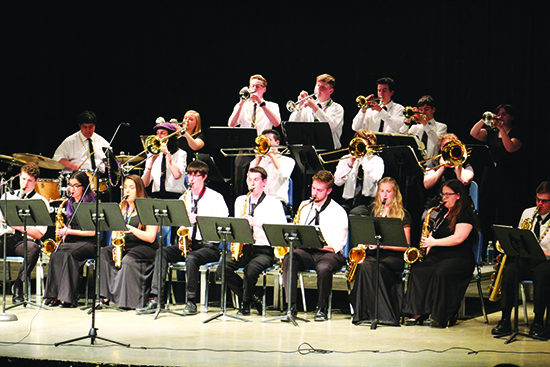 Both Getchell and Marysville-Pilchuck high school jazz bands showcased their skills for Preservation Hall. Fred, Louis and Gregg made special appearances and performed alongside the bands. 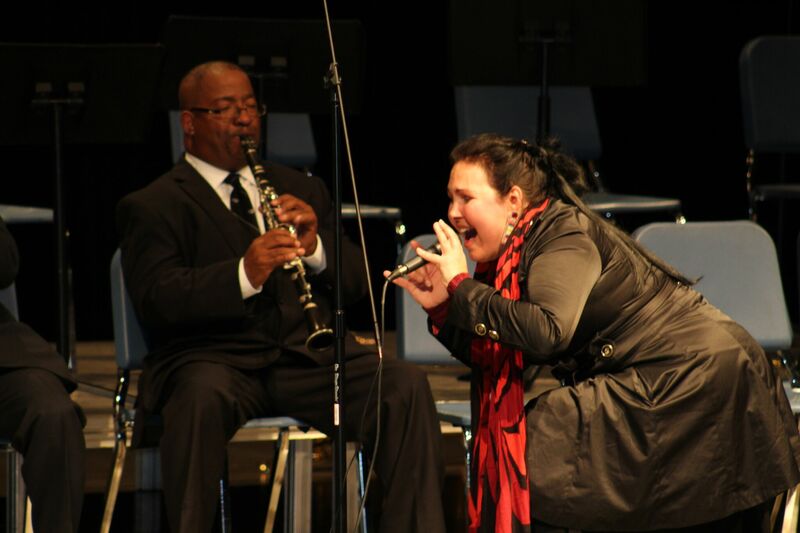 During their final performance the band shared the stage with Native American Grammy Award Winner, Star Nayea. The band played Dixieland jazz, jazz blues, and ragtime as well as jazz funeral music. The audience was highly engaged and interactive throughout the bands last set. The crowd sang along to classic songs such as What a Wonderful World and A Closer Walk with Thee. Nearly everyone in attendance marched around the auditorium before rushing the stage while the horns blew to the tune of When the Saints Go Marching in.